Holger Leusch, Benjamin Reichel and Karina Hochstein have found themselves with a similar problem. Worse still, Holger travels to Cambodia a lot, and his German phone provider doesn’t even have a roaming agreement with any of the Cambodian telcos, so he’s not able to use his phone there at all. He found VoIP unusable in Cambodia, with patchy calls, lousy bandwidth, delays and dropouts. Like us, he needed to be in constant touch with his office. Enter (you knew this was coming, didn’t you?) the Pi. Many of those in Holger’s position would look into buying a SIP-based GSM gateway. GSM gateways are expensive things: Holger’s research found that a single GSM port (and you’ll need two, one at each end) was priced between €200 and €400. 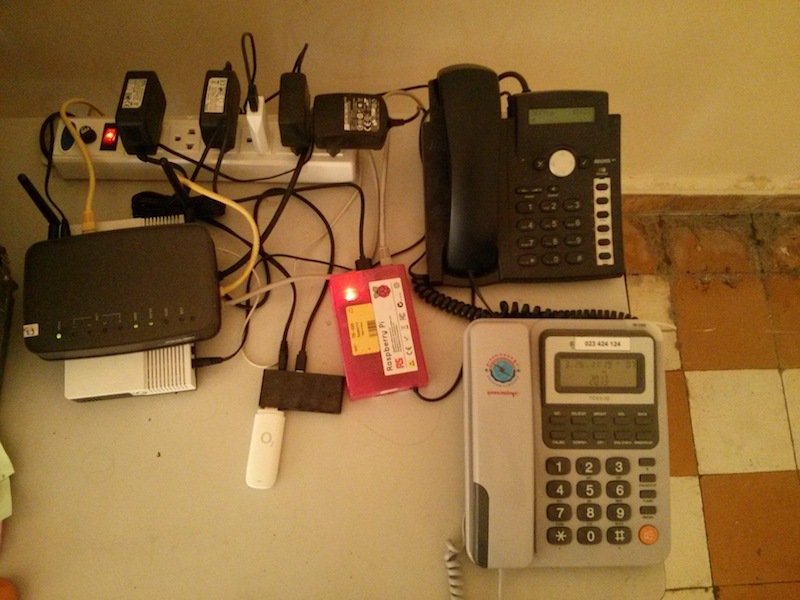 “For this to pay off, I would have to make a whole lot of phonecalls.” So he, Benjamin and Karina built their own, using a Pi running RasPBX; a Huawei dongle for 3G; a Chan dongle which works as an Asterisk channel driver; and a USB modeswitch. The whole kit came to €75. The connection quality over the 10.000 km spanning 64 kbps Asterisk SIP trunk between both gateways actually is so amazing that none of the callers even noticed that I was out of the country at the time! Ofcom has recently clarified that it is entirely legal under UK law for end-users (whether businesses or ordinary consumers) to buy, install and use GSM gateways for their own use. However it is currently illegal under UK law for anyone to use GSM gateway equipment to provide a communications service by way of business to another person or organisation, irrespective of where the gateway equipment is located, or how many or few end-users are connected to each gateway. This prohibition on ‘commercial’ use applies equally to the mobile network operators (MNOs) as to other organisations, since the MNOs’ licences do not currently extend to the installation and use of GSM gateways. Basically, you can build a gateway yourself in the UK – but woe betide you if you try to sell or lease one. The mobile network operators sometimes take this even further (for reasons which you might, when you consider all the lovely money that results from those roaming charges, think to be a bit…venal): for example, if Vodaphone suspects you’re using one of its sim cards in a GSM gateway it says it will disable the card. So be sure to research what the local rules are carefully before you implement something similar yourself. You can read more about Holger, Benjamin and Karina’s setup at Carrier Connect Shout Out. Did you check Indian laws.. Are we allowed to do it ? No! The Indian law does not allow this. The Govt of India wants to keep limited points of inflow and out flow so they can monitor it. TRAI has a hot line where you are supposed to report foreign calls that originate from Indian numbers (this – VoIP GSM). I think it is stupid. Any terrorist worth h(er/is) salt shall use encryption and it cannot be cracked before the message looses it’s value. Indian law doesn’t allow termination f VoIP originating outside of the country to be terminated/interconnected to the local PSTN/mobile network. However, you may use a stand-alone VoIP ATA (and phone) connected to the internet to make/receive calls to/from abroad. This one is a home communicator system similar to the communicator badge worn by the Startrek Next Generation folks. I know it’s phony on TV, but I don’t see why some wise person does not come up with something that can be used by merely saying the persons name. Calling Connie, or Calling Larry and the connection is made to the device near Connie or Larry. Follow the links – instructions there! I haven’t seen it on the PI but there are commercial implementations out there. One of the local hospitals uses one such system. Sorry this was supposed to be in response to Homer. I thought it might be but was unsure. Do you have any idea of what it might be called? Never mind. With your hint of tracking in Hospitals, I was able to search for Hospital Tracking System and come up with RTLS which stands for Real Time Location System. That’s the concept I want. 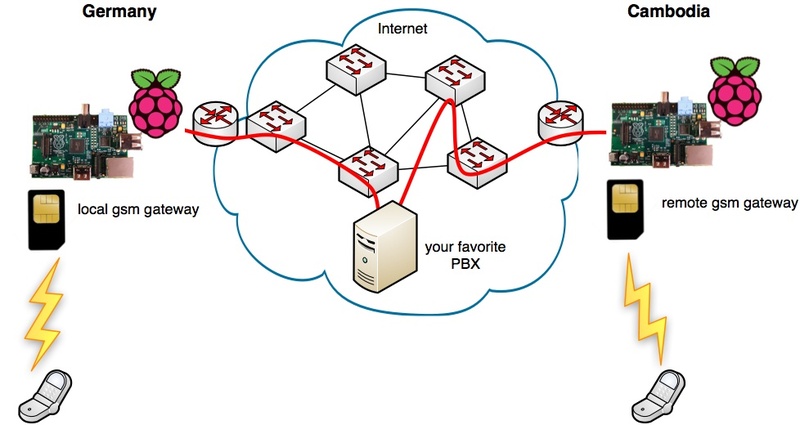 So, how does this tunneling solution get better connection quality than those VoIP providers? “Good things come to those who wait”. And boy have I waited long for this hack! One year to be exact. Thank you for sharing. Strange wording. They’ve said that they will disconnect SIM cards if they believe they are being used illegally. As this blog entry states, Ofcom have stated that it’s not actually illegal to set up a GSM gateway for one’s own personal use in the UK, but one cannot provide a GSM service. Therefore, logic might suggest that Vodafone should not disconnect SIMs which which are being used legally in a GSM gateway. Would you mind posting detailed how to please? Great! Pretty nice thing… I found this Asterisk Telefonanlage tutorial in German extremely helpful as a pre-requesite for the installation of the GSM gateway. Just wanted to share with you. After much tinkering, I was able to setup freepbx with chan_dongle on my pi. Sadly, because of the double-nat that my isp is doing on their server side, I cannot forward the port of my asterisk so that I can use my voip account. Is there any work-around for this using the existing setup? i want to by Raspberry Pi. but me live in cambodia.where by? Same question from my side. I am living in Cambodia and would like to purchase a Rasperry Pi here. Unfortunately I couldnt find any shop who is importing them yet! I’d really like to set up a VPN on a server (not pi) which has a static and then connect the pi to the VPN and my laptop to the VPN and connect to my pi that way… Any ideas? I am new to asterisk/chan_driver. I am thinking of something and was wondering if it can be done. I have a SIP account with a provider. I can use any sip client to make calls. I can buy a usb gsm dongle. I want to install the dongle with a gsm sim card in the pi. Also setup my sip account to be used by asterisk. Then when I call this sim card to be given the option to send a number via dialpad on my gsm phone. Then the asterisk/chan driver to dial this number in my sip account and transfer it to the active gsm call. In that way I can use the sip account to make calls from my gsm phone. If so can someone post a how to? There are some posts in the forum about getting asterix to work – I suggest doing a search, and if necessary, reposting your question in the forums.